If there’s one thing Rihanna seems to have in abundance, it’s confidence. She could wear the most unflattering outfit and manage to look good in it. 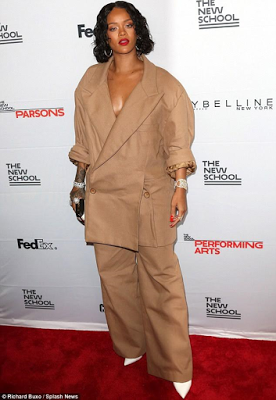 The singer brought back the 90s by dressing in this oversized beige-colored khaki suit for a Parsons School of Design Benefit in New York on Monday. The 29-year-old was honored for her work with design students at the benefit so she donned this suit, which is a custom Matthew Adams Dolan design. To complement her dramatic attire, Rihanna opted for silver accessories and a bright red lipstick. She also had on white pointed heels and a striped clutch. It appears she was braless beneath the oversized jacket.